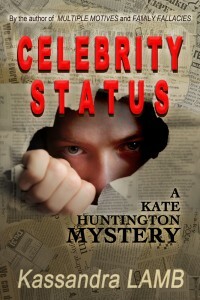 I am working on getting Celebrity Status out in paperback. I have the proof from Amazon and it is gorgeous. But before I forget, here are the buy links for the e-book, which is already available on Amazon and Barnes & Noble. 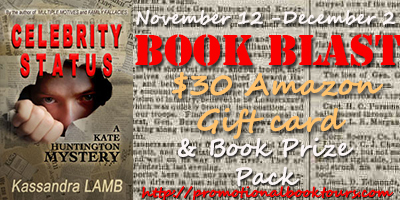 It is at a special introductory price (for my loyal fans) of $1.99 for the next week or so only! Don’t worry, the printing is clear on the final version of the back cover. Mainly I wanted you all to see the picture of the house. It will be on the back cover of all of the paperbacks. (Yes, I’m going to get the whole series out in paperback soon!) I feel like Kate’s house is practically a character in the books, since it plays a big role in a lot of them. As always, I am so grateful for your support!